We build strategic, engaging websites that instantly reinforce credibility, communicate established messaging, and ultimately convert users into loyal brand advocates. 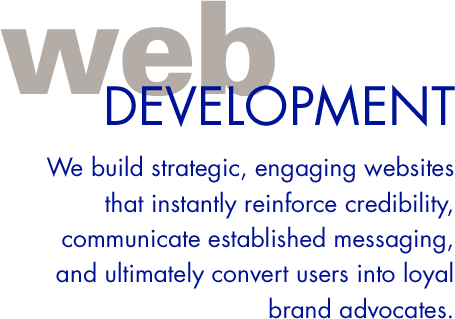 Web development is a highly collaborative process where our content, design and development teams work harmoniously. We provide the right balance of substance and image. Our sites are designed from the ground up, as we consider everything from effective navigation to “best practice” search engine optimization. All of this work comes together in the form of a site that not only looks great but ultimately helps you grow your business and your footprint online. Creative Navigation websites are built on open-source frameworks and feature responsive web design that adapt to each unique visitor whether on a desktop computer, smartphone or tablet. We dynamically handle the resizing of content and imagery for a variety of different screen sizes in order to ensure the website is effective and easy to use on any device. We work to develop websites that flawlessly operate, reinforce your brand, and deliver on user expectations —all while accounting for nearly 15 million unique, often unstable website viewing environments. Our developers work alongside the project’s lead designer and content strategist to strike the perfect balance between presentation and performance—ensuring the highest level of design accuracy and user experience. Often, this process is time-consuming and requires all disciplines working together to not only deliver the most elegant and smooth experience possible but also to potentially unveil opportunities to boost the site’s performance.